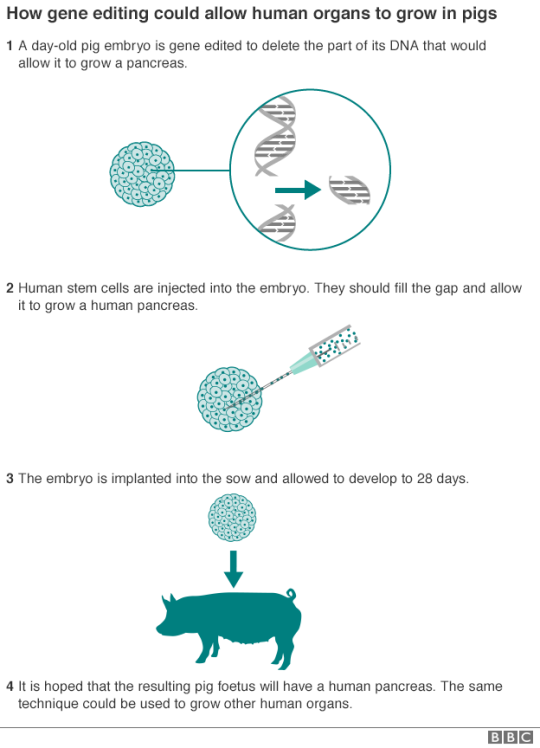 [BBC News] Scientists in the United States are trying to grow human organs inside pigs.They have injected human stem cells into pig embryos to produce human-pig embryos known as chimeras. The embryos are part of research aimed at overcoming the worldwide shortage of transplant organs.The team from University of California, Davis says they should look and behave like normal pigs except that one organ will be composed of human cells. [Zurich Times] Perhaps this similarity between humans and pigs is why we were told not to consume the swine? It is surprising how many Christians today without any hesitation continue to consume the Swine even thought the prohibition against it is quite clear. Perhaps is it just like Usury and the reminder not to engage in that practice either, but who has time to listen to such things in our quest for modernity and progress as we can see all around us. Not only is this animal unclean unto you, but it’s resemblance to humans should also make you question why there is such a biological similarity between humans and pigs. So even touching it is prohibited and here we are openly growing organs inside the Swine? How disgusting has modern western civilization become and when will people wake up to this reality? The Jews do not eat the Swine either just like Muslims so our question really focuses on modern day Christians and why they become so lax with the Biblical Dietary Laws?